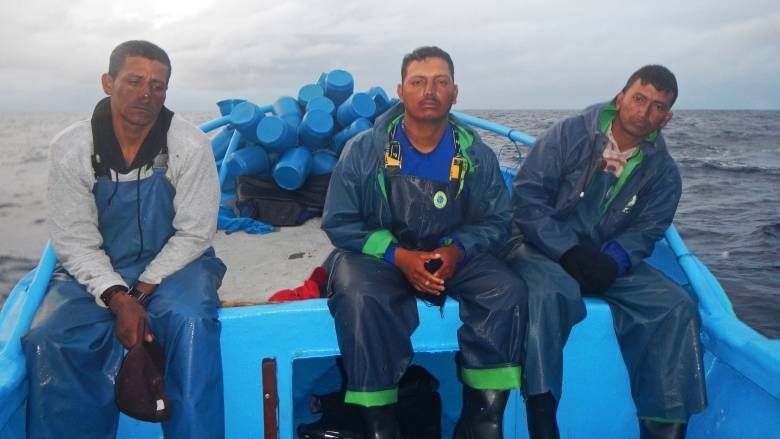 Ecuadorean fisherman Oscar Alvia Anchundia, centre, along with two compatriots, was captured by the U.S. Coast Guard in November 2017 while smuggling cocaine off the coast of Guatemala. Canada's navy and air force continue to be involved in the capture of drug smugglers on the high seas in co-ordination with the U.S. Coast Guard, even after high-level Canadian military officials investigated allegations of detainee mistreatment that may violate international human rights obligations. An exposé by the New York Times and the Investigative Fund, a New York nonprofit, last November revealed that U.S. Coast Guard detainees were routinely shackled by their ankles to the decks of ships and left there for weeks, often exposed to the rain and sun. Many of the detainees were insufficiently fed and forced to sleep on hard rubber mats. Senior military officers in the Canadian Forces launched an inquiry into allegations of mistreatment of detainees by the US Coast Guard. Months after communications circulated, the Canadian Navy deployed again on a mission to assist the Coast Guard's drug patrols. According to court filings and public statements, over the past three years, Canada has helped intercept dozens of suspected smugglers that the Coast Guard has detained. Seven of these detainees — all men from Ecuador or Colombia — have now made similar allegations of mistreatment by the U.S. Coast Guard. CBC Radio's The Current and the Investigative Fund have learned that in the weeks after the New York Times piece appeared, high-level Canadian military officials, including brigadiers-general, discussed the allegations of detainee mistreatment. Internal Canadian Armed Forces communications show Chief of the Defence Staff Gen. Jonathan Vance and the deputy minister of national defence, Jody Thomas, were aware of the allegations, which the Canadian Forces has now confirmed. The military officials also discussed the implication of the allegations for forthcoming Canadian involvement in the U.S.-led, multinational counter-narcotics mission known as Operation Martillo. Months after these communications circulated, the Canadian Navy deployed again on a mission to assist the Coast Guard's drug patrols. Those ships returned in early May. A joint investigation by CBC's The Current and The Investigative Fund heard from seven suspected drug traffickers, who were picked up in international waters with the support of the Canadian navy. They report being mistreated after being handed to U.S. Coast Guard vessels. Scholars of international law argue that the allegations raise troubling questions. Amnesty International and the British Columbia Civil Liberties Association, in an open letter, demanded answers from Defence Minister Sajjan regarding possible Canadian complicity in human rights violations. “The United States is violating international law, and Canada is doing so by complicity,” said Michael Byers, a professor of international politics and international law at the University of British Columbia in Vancouver. Twelve years ago, the Canadian military launched a new front in the war on drugs. With Operation Caribbe, Canadian ships deployed deep into the Pacific Ocean and the Caribbean to assist efforts by the U.S. to halt maritime cocaine smuggling out of South America. In 2010, Canada's role grew, with a memorandum of understanding (MOU) allowing U.S. Coast Guard officials to ride on board Canadian naval ships and use the vessels as platforms for law enforcement operations. 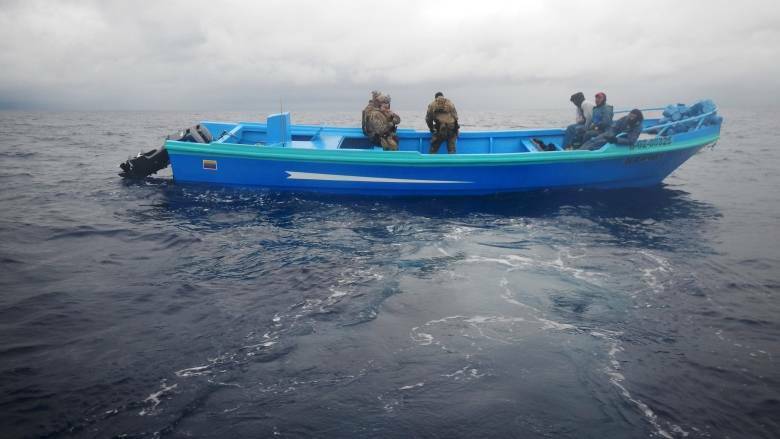 According to the Canadian Armed Forces, by the end of 2017, Operation Caribbe had seized more than 85 tonnes of cocaine. "The United States is violating international law, and Canada is doing so by complicity." The Coast Guard had been seizing drugs in the high seas for decades. But with Operation Martillo, the U.S. switched gears. Instead of returning most suspected smugglers to Latin America, they kept most on board in order to deliver them to the U.S. for prosecution. The unintentional result was protracted detentions aboard ships ill-equipped to serve this role. In 2017, a record 700 suspects were pulled off smuggling boats and brought aboard U.S. vessels. Most were later tried in federal courts in the U.S. Seven months after his detention by the Coast Guard, Oscar Alvia Anchundia, 28, has trouble keeping memories of the ships from consuming him. Alvia had been a fisherman all his life, working off the coast of Anconcito, Ecuador. He said fishing barely allowed him to support his wife and children, so he agreed to take a cocaine-smuggling run. He was assigned to join two other fishermen on a speedboat that left northern Ecuador in October 2017, bound for a point in the sea off the coast of Guatemala. Alvia said that when he first heard the sound of an approaching motor, he was relieved. The trip had taken a week, and the men were running out of food. They assumed the approaching boat was manned by their co-conspirators, sent by an unknown boss to collect the nearly 500 kilograms of drugs they were carrying. The plan had been to hand over the drugs and return home. But when a floodlight was switched on, Alvia knew they were under arrest. What he did not know was that the vessel was a Canadian patrol boat, dispatched from a Royal Canadian Navy vessel. Typically on these boats, a Canadian operator is joined by a team of U.S. Coast Guard officers. Court records show that after determining that Alvia's vessel was stateless, U.S. Coast Guard officers searched the boat, discovered the drugs and, because of weather-related safety concerns, brought him and his two companions aboard the Canadian vessel. Alvia recalled that they were led to a tent and permitted to rest. They were provided a meal and allowed to walk the deck, under guard, to stretch their legs. A day passed on the vessel, and then the men were delivered to a second ship, a U.S. Coast Guard vessel called the Vigorous. There, Alvia said, his detention took a turn for the worse. Court records show the Coast Guard held him for more than two weeks. He recalled being chained to the decks on three different U.S. ships, shackled at all times, except for an occasional trip, under guard, to use a makeshift toilet on the deck. "When it rained, we were all soaked," he said. "They put cuffs on us, chained us up." On two of the vessels, he recalled, he and several other detainees slept outside. Alvia said that at no point was he told where he would be taken or allowed to contact his family, an attorney or the Ecuadorian consulate. Seventeen days after he was stopped in international waters, Alvia was finally delivered to Largo, Fla., where he was interviewed by federal agents. In April, he pleaded guilty to drug trafficking and was sentenced to 46 months. Some detentions involving Canadian assistance have stretched on for far longer. In February 2015, a U.S. Coast Guard team riding aboard the HMCS Goose Bay, a Royal Canadian Navy vessel, aided in the interception of Alfredo Herrera-Villarreal, 61, from Cartagena, Colombia. Herrera-Villareal and seven other suspects were shackled on board U.S. Coast Guard ships for 40 days. “To this day, I suffer from nightmares because of the experience I went through on those boats,” Villarreal wrote in a letter from federal prison in Mississippi, where he is serving an 11-year sentence. Several current and former Coast Guard crew members and officials who spoke on condition of anonymity confirmed the allegations of mistreatment by detainees. “We don't have the space to properly hold them,” said a member of the Coast Guard who has deployed on several recent Operation Martillo patrols. "He was deprived of information about his future and he feared for his life daily." Boyd, who has also evaluated U.S. service members returning from tours in Iraq and Afghanistan, said she determined that Valdez suffered from post-traumatic stress disorder. But according to Canadian defence officials, the directive may not apply to Operation Martillo detainees. They argue the people the military helps the Coast Guard intercept are not, in fact, Canadian detainees, as they remain formally in U.S. custody the whole time. “We never have a detainee, we never have a person, under our custody,” said Lt.-Cmdr. Collin Forsberg, commander of the HMCS Whitehorse, which recently returned from a drug interdiction mission in the Pacific. 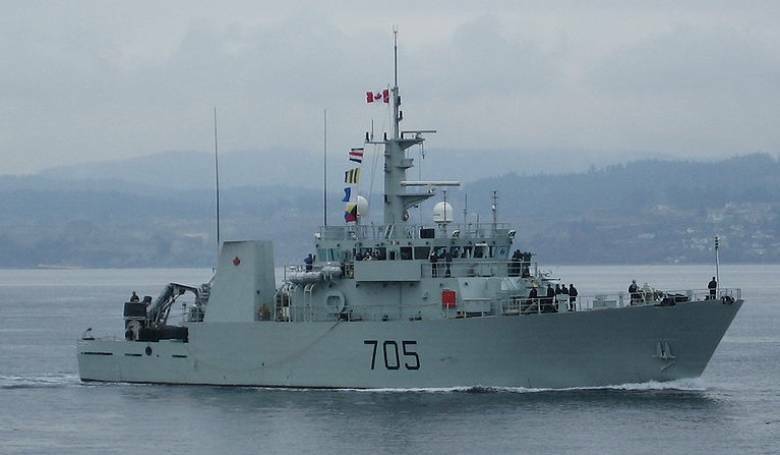 HMCS Whitehorse has been involved in a number of drug-smuggling interventions carried out by the U.S. Coast Guard. No detainees allege that CAF members were directly involved in their mistreatment. Byers, the legal scholar, argued that doesn't absolve Canada of responsibility. “A Canadian naval vessel is an extension of Canadian territory onto the high seas, and that vessel can only be there because of the dozens or hundreds of Canadian Forces personnel who are operating the ship,” Byers said. This article was reported in partnership with The Investigative Fund at The Nation Institute, now known as Type Investigations, which is a nonprofit U.S. media organization.